New software capabilities developed by computational scientists at the US Department of Energy's (DOE's) Oak Ridge National Laboratory (ORNL) and the Rolls Royce Corporation could soon help engineers lift the gas turbine engines of aircraft and power plants to higher efficiencies. Using modeling and simulation, ORNL and Rolls Royce are developing tools to create a virtual sandbox for CMC manufacturers to test design parameters and identify strategies to make CMC production more reliable. Partnering through DOE's High Performance Computing for Manufacturing (HPC4Mfg) program, the collaboration contributed to the first physics-based software focused on fine-tuning CMC manufacturing. "CMCs represent a step-change technology for gas turbine engines, but, because it's a new technology, the technique used to produce these parts is a very challenging process," said ORNL computational scientist Ramanan Sankaran, lead code developer for the project. "By applying high-performance computing to this problem, we can get a better physical understanding of what's happening during manufacturing and potentially identify strategies to speed up the process." Pioneered by ORNL and others in the '90s, CMCs combine brittle components—silicon carbide (SiC) ceramic fibers arranged in a fabric-like weave—to create a surprisingly resilient material. The key to this strength lies in application of a common SiC precursor, methyltrichlorosilane, a gaseous vapor that flows through the fiber weave, or "preform." The vapor reacts on the surface of SiC fibers at elevated temperatures to coat the material. If applied long enough, the gas will eventually fill all the air pockets of the preform to make a solid component. The problem with this manufacturing technique, known as chemical vapor infiltration, is one familiar to any experienced baker whose goods are in high demand: How to uniformly "cook," or densify, the CMC material from the inside out and in the minimum amount of time. "If you fill up all the gaps in the outer layers of the ceramic fiber weave, you have pretty much sealed off the inside and you end up with a hollow product," Sankaran said. "Within Quilt, we've developed the capability to predict the expected quality of a CMC sample based on a few major variables." "In the long term, this could be used for optimization of the weave pattern, which has an outsized effect on final product quality," Sankaran said. Based on the success of its initial work—resolving the CMC model down to the tow-scale—the team has begun pushing into even higher resolutions. In late 2018, Sankaran began work to resolve the team's model down to the fiber-scale using the OLCF's Cray XK7 Titan supercomputer. At this scale, each tow is modeled as a 50-fiber bundle and the spatial resolution is expanded to 10 billion grid points—more than 16 times the resolution of the tow-scale simulation. 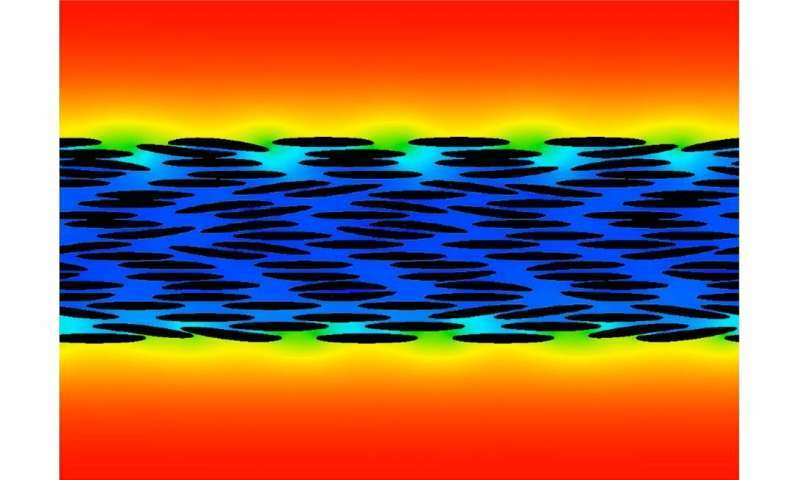 Under these conditions, the team can account for billions of gas-fiber interactions and can incorporate greater realism into its chemical reaction models. "As we make progress on these fiber-scale simulations, we'll start to see where they differ from the tow-scale," Sankaran said. "This could lead to additional pathways for optimization."